Solange, a fashion fail : Never ! Blog posts about celebrity carpets looks are not my favourite but you might have notice I am a Solange Knowles fan . Yes ! I said it ! So the only reason reason I am blogging about her and this specific look is to defend her style ! How can you not like her style ?! I wonder. Are you crazy ?! She looks H.O.T ! Why criticising the girl when she's just being herself, has her own style, always pick the best designers and looks so effortlessly chic !? She's quirky, classy, and wears prints like no one else in 2013. You don't get the look; I can accept that but don't comment on what you ignore. 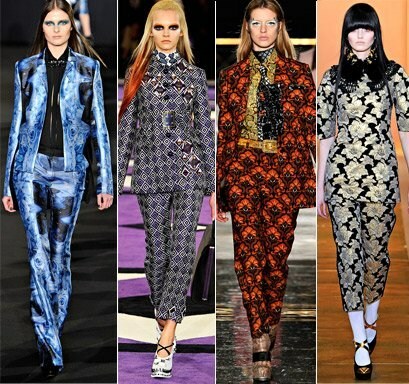 Print mixing is a main trend since Spring 2012. The matching suit has been on every catwalk for the past 18 months ! You don't need to be wearing the classic red dress to shine at a première. So you're problem might be the hair. Oh yeah ! I get it now. That's another issue. She just looks too "ethnic" for you. Prints + afro hair = "Hot mess" ?! I don't think so ! Her skin is flawless, make up on point and hair are natural. Natural like in " all hers, wearing my hair the way they are growing out of my scalp"" natural ! And you are still hating ? Let her do her thing if you don't mind. It is so refreshing to see something different on the red carpet nowadays that I will defend her as often as I can ! And yes I have got a girl crush on her so watch out ! I heart Solange. Her style is individual and easily misunderstood. If you know about fashion then you know Solange has got it nailed. I love her too !